“Metaphysics means anything that is beyond the physical frame of reference. That is anything that is beyond the range of the 5 physical senses. Anything that cannot be touched, tasted, heard, seen, or smelled can be placed in the Metaphysical Realm. If you think about it, we encounter the Metaphysical world every day, in a myriad different ways. Our thoughts, our dreams, our emotions, our intuition are all aspects of the Metaphysical world. We speak of having a ‘6th sense’, of having ‘feelings’, or ‘luck’, or of things being ‘coincidences.’ For many, experiences with the Metaphysical world seem like miracles. We hear of a full recovery of someone who should have died, according to all the physical evidence. We hear of unlikely coincidences that bring good fortune or misfortune. We have feelings of deja vu. We have dreams that seem too real. There are chance meetings that set us off on life changing paths. There are illnesses that cannot be detected in the body and so on. 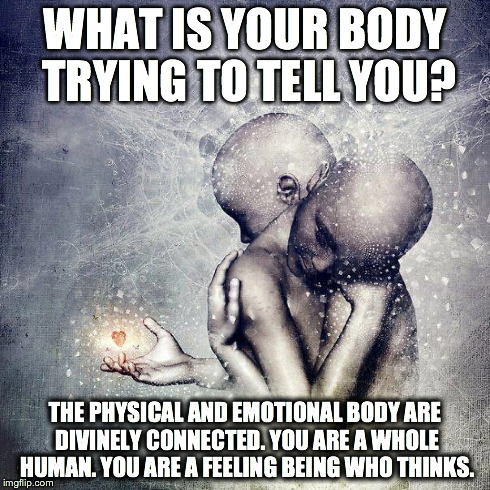 In healing, we speak of the ‘Mind/Body’ connection, or of wholistic healing which encompasses the Body, Emotions, Mind and Spirit. On a personal level we may think of Life’s experiences of the Metaphysical realms as getting to know our own Spirit Self. In healing, my experiences of the Metaphysical take the form of physical manifestations of mainly Emotional and Mental disharmonies. 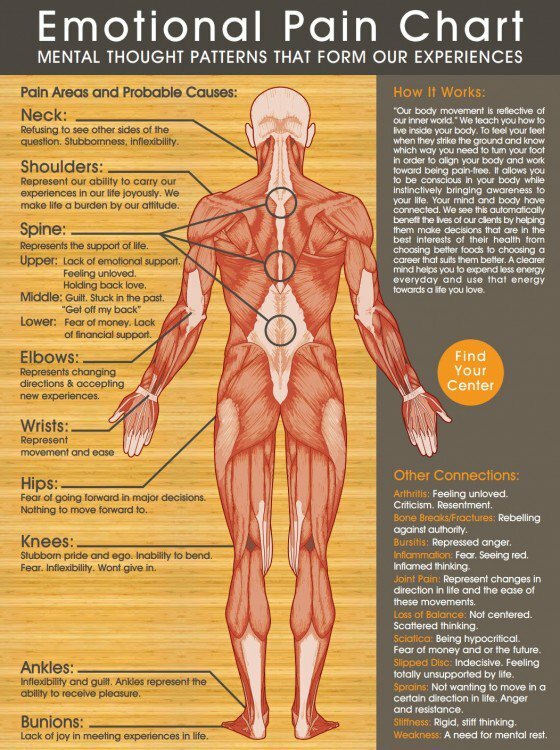 These pages deal with the Metaphysical meanings of Physical symptoms we usually describe as illness. Ultimately we all experience the Physical and Metaphysical worlds in our own ways. Wholistic Healing of the individual occurs at different energetic levels. These are the physical, emotional, mental, belief and spiritual levels. For those on the path, there are a great many more levels and sub levels identified in various cultural, religious and philosophical traditions. But for our purposes we can look at the individual in these four broad realms to at least begin the process of healing. 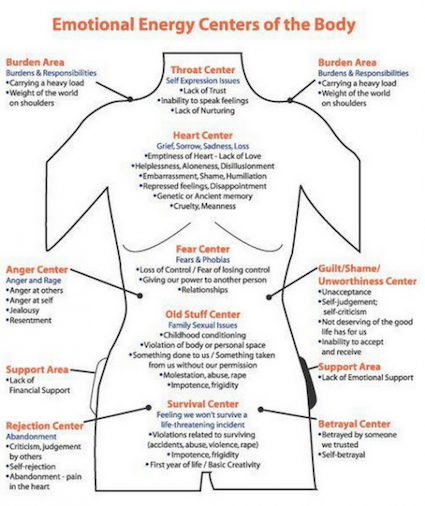 Louise Hay, in her book, ‘You Can Heal Your Life,’ has done some interesting work in this area. Other references are; Traditional Chinese Medicine diagnostic principals, as well as my own personal experiences. Please note that these are only general observations, serving hopefully to illuminate areas that you can look at more closely in yourself or with the help of a healer. You are the one who knows you best. As you go through these observations try to expand your awareness beyond your own life to see also how these disharmonies are reflected in your own family, community, country and in the world. 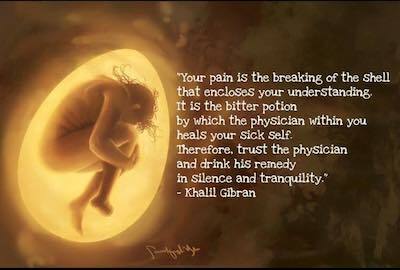 Ultimately it is our own choice to heal or not to heal and it is our own innate healing ability that is activated. Mid back; The mid back is the link between the shoulder and the lower back. It can be a weak link. As we firm up our shoulders and become willing to take on the responsibilities of Life, and we have gathered around us the financial and emotional support we need (lower back), something sneaks up and stabs us in the back. This is a blind spot. Not only can we not see it, but is very difficult to reach. The weak link crumbles. It is the saboteur or seducer that takes us off our path. Located in this area are the Tonification points (called ‘Shu’ points) for the Liver, the Stomach, and the Spleen. 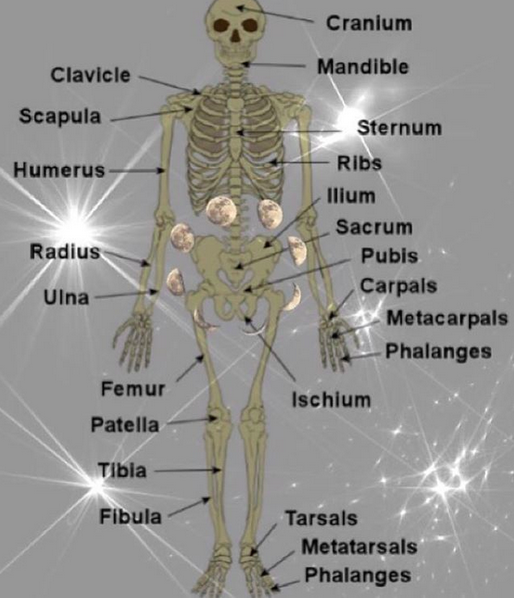 These organs are responsible for the transformation and transportation of Qi, and the free flow of Qi in the body. Blockages here affect the entire body and can stop you dead in your tracks. The Spleen represents Worry or over thinking and the Liver represents Anger or base emotions. Both of these can sabotage even the best laid plans. Louse Hay suggests that the mid-back represents Guilt and stuck in the past stuff. Lower Back; The Lower Back represents support; financial support, emotional support of family and friends, and support of God or the Universe. The Kidneys are located in this area and Kidney dysfunction results in Fear/Fright/Phobias. A sore lower back may indicate that we have taken on more than we think we can handle. This is a dysfunction, only if it is not the Truth. If we have indeed taken on too much, that would be indicated by a physical trauma to the back and all we need to do is lighten the load. Chronic low back ache, though, not associated with any trauma is the one with the Metaphysical application, and the one related to Kidney depletion. Kidneys are considered to have a central function relative to other organs since it is where Yuan Qi or our Primary Essence is stored. Yuan Qi is also known as Primary Qi or Congenital Qi. 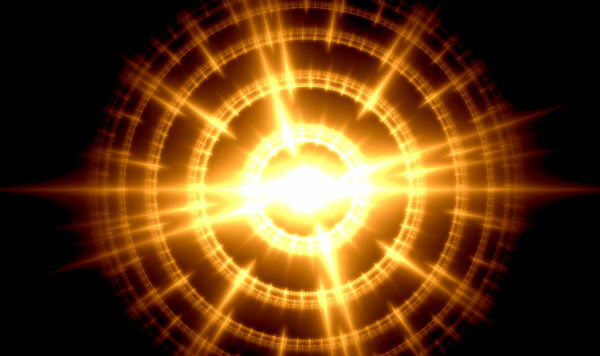 It is the Qi you are born with and determines your relative strength in the world. It is considered to be quite difficult to strengthen an already weak Yuan Qi, but it can be done.Low back pain is often diminished by strengthening the Kidneys. In short, Low back pain, generally refers to a lack of trust in the Universe to protect and support. Louise Hay suggests Fear of money is indicated. The feet often store toxic energies (as often to do with grief or resentments as not), as far away from the Heart as possible. This means, in the feet. Often, these are issues that go all the way back to childhood. Lacking the tools to effectively release grief or resentment the body stores it, like it stores fat. Over time, more and more toxic energies are stored here and fill up the receptacle. In many cases, the entire leg can become involved and the waste starts leaking back into the system. This is a very serious situation indeed, that can lead to amputations, blood disorders and even death, as the body struggles to protect the Heart. Metaphysically, it becomes clear that the space you are standing in is painful. The key is to move on. Stop dwelling on the past, release or transform whatever it is that keeps you emotionally standing still. Louise Hay suggests that feet represent our understanding of ourselves, of Life, and others, and toes represent minor details of the future. Throat; The Throat represents our Will, and our ability to communicate, both with others and with ourselves. Sore throats, lumps in the throat, tumors all represent difficulties in saying what we want to say. Lumps, both physical tumors and those that are non-manifest (Hystericus Globus) are our willful attempts to block free expression of emotion and of our identity. The Throat is another one of those weak links that can seduce or sabotage you from your path. The Throat is the channel between the Head and the Heart. In Chinese Medicine it is said the Heart houses the Mind, especially in its connection with the emotion of Joy and the expression of Love for ourselves and for others. Have you ever had a great idea, gotten your body motivated, put your Heart into it, only to say something completely stupid which makes a mess of things? Have you ever felt the urge to say something complimentary and suppressed it? Have you ever just blurted out something that just seemed to by-pass the brain? How often does a careless or ill chosen word create havoc in your Life? Where this comes from is all the things you have not said over the years that get stuck in the throat, needing to get out, and out they come, one way or the other.